This press photo dated March 26, 1931 shows what remained of the soon-to-be-covered-with-forty-feet-of-water town of Linn Creek, once the seat of Camden County, Missouri. Many structures had been torn down in this town that was once home to 500+ residents. Some buildings were moved to the new Linn Creek a few miles away on higher ground. A new county seat was built – Camdenton, Missouri. The movie Deliverance, based on the novel by James Dickey, is of course about a river about to be impounded. Near the end of the movie there are shots of a church being moved out of the basin. But back to old Linn Creek – Our assumption was that what they didn’t tear down or move, they burned. Considerable expense was incurred clearing the trees out of the basin for Lake of the Ozarks, but as this photo shows, they didn’t get them all. Timber removal was a surprising percentage of the cost of the whole project. There was some tension between the crews hired to clear the timber and anti-dam residents when the crews ate at the restaurants and used the stores and filling stations of the town. People in Linn Creek were pretty much against the dam – a sentiment led by J. W. Vincent, editor of the Linn Creek Reveille. 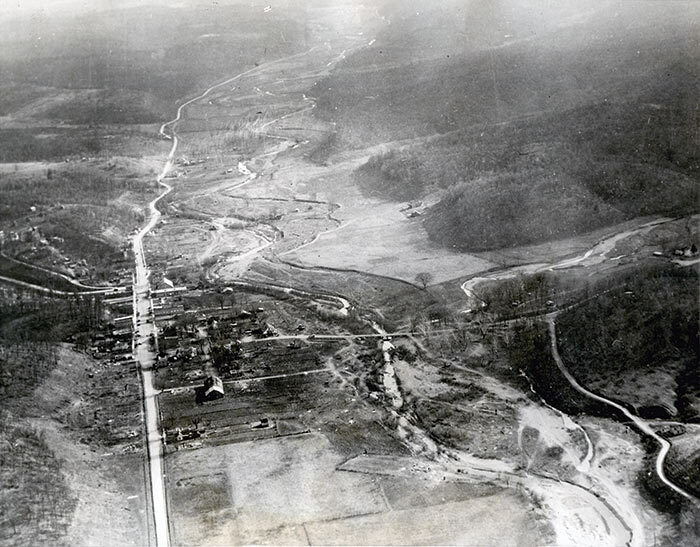 There are a lot of aerial photos of the dam under construction and as the lake filled – but not so many of the demise of Linn Creek.